If you are coming from north/Wilshire, the parking entrance will be on your right hand side after you pass Gregory. 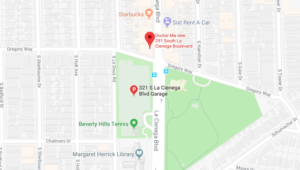 If you are coming from south of Olympic, it is the easiest if you make a left onto Olympic, right onto Le Doux, right onto Gregory, right onto La Cienega in order to pull into the parking entrance. If you are coming from west/Santa Monica, take Robertson, then Gregory, then right onto La Cienega to get into the parking entrance. If you are coming from east, take Robertson, then Gregory, then right onto La Cienega to get into the parking entrance.